A public forum on proposed private campsite development on Sand Island drew a large crowd Wednesday night. St. Helens Council Chambers were packed during a forum Wednesday, April 6, when Brad Hendrickson and Andrew Niemi, two St. Helens men who are proposing to lease a portion of the island to develop a private campground, discussed their idea with the public and answered questions from community members. In late March, the City Council voted to approve a lease agreement with Niemi and Hendrickson, who are poised to launch St. Helens Sand Island Campgrounds LLC on Sand Island. The idea behind the business, which was first proposed to the council last year, is to expand the island's current 37 unmarked campsites, build more amenities, provide an onsite camp host, provide free shuttle service to the island, and monitor overnight boat docking, which will incur a $2 fee. Campsites will be $30 a night. People who wish to camp on the island will be able to use public parking lots, several designated spots on River Street, and Hendrickson is also proposing a valet parking service as a possibility. When Hendrickson first pitched the idea he was hoping to deter homeless boaters and transients who currently use the island, leaving behind trash, drug paraphernalia and other items. 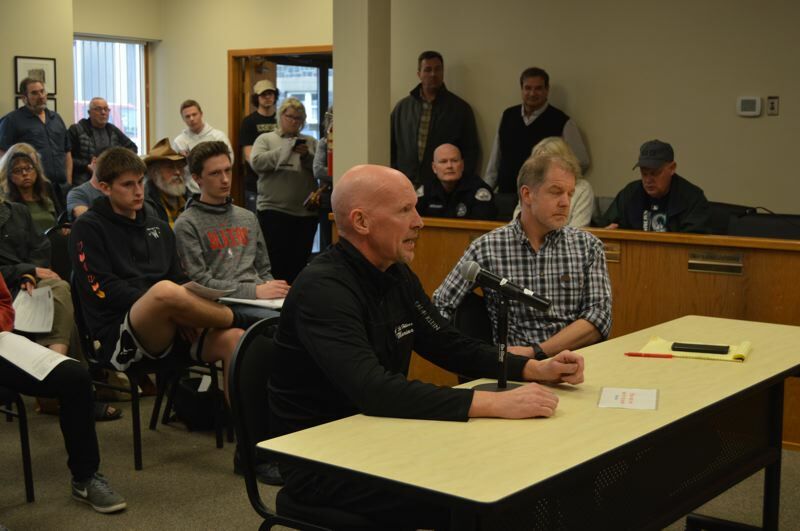 "The city owns the property and has a liability whether there's a campground or not," Niemi said during the forum Wednesday. Council chambers were at standing-room-only capacity for the forum. Mayor Rick Scholl moderated by allowing attendees in favor, opposition, and those giving neutral testimony roughly 15 minutes each to speak. Some residents cited concerns about public access being restricted on the island, but Hendrickson said the island is still a public park and visitors will be able to use the day-use areas, nature trails and beaches. "I don't see a whole lot of the island not being accessible," Hendrickson said. "There's a lot of challenges ahead of us, but none that we can't overcome," Greenway said. He later added to his sentiment, "This benefits the community as a whole with someone being over there being our eyes." Many of those who spoke in favor of the proposed campsite and lease agreement saw it as an opportunity for people to use a city park that can be inaccessible to some. Carmin Dunn, a parks and trails commissioner who spoke in favor of the proposal, said she and her family have never been to the park since they don't have a boat. "I'm in favor of it. My family has never been to Sand Island because we don't have a boat and I'm on the parks commission, and I've never been there and that's kind of silly," Dunn said. "I just think about all the people in the community who don't have access to it, so I'm in favor of getting it used and having more people there." Phillip Stanton, a part-time St. Helens resident, said offering a shuttle service also provides people an opportunity to try something new in St. Helens. "It exposed me to something new in St. Helens and I would like other people to have that experience too," Stanton said, referencing the first time he was on Sand Island. While putting a private campsite on the island and providing access for people without boats would be beneficial, some pointed out that it wouldn't address the overarching issue with homelessness in the St. Helens area. "We've got a serious livability problem and Sand Island is just the tip of the iceberg," Shauna Stroup-Harrison, a local resident and realtor, said.